We enjoy connecting with you at events across the country. See where we’ve been recently, and find out where we’ll be next. We had a colorful stop in Houston, at IIDA’s 2016 Product Runway, a fashion competition that challenges design teams to use architectural materials instead of textiles to create original handmade garments. This year’s designs had to use sponsored hard- and soft-good materials for no less than 80% of the final creations. The theme of this year’s event was Avant Art, pairing the teams with famous artworks from specific artistic movements throughout history. Our team was assigned Neo-Expressionism, specifically a painting by Jean-Michel Basquiat. F+S was paired with PBK Architects who used Fused Graphite Mirror and Fused White Gold Mirror materials to create thematic elements from the painting, which were affixed to the garment. The outcome was brilliant, and our team won crowd favorite. 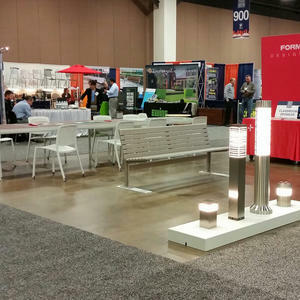 A week later found us at the 2016 Texas ASLA Conference in Fort Worth, one of the largest regional ASLA events in the country. As a Classroom Sponsor, our 20’ x 20’ booth gave visitors ample chance to check out our newest Outdoor Products. We hope you’ll join us when we’re in your area!